Ask fellow campers about "Yuba State Park - Painted Rocks Campground" and nearby attractions. Stayed for a week in early/mid September. Other than the technically off-duty host and the occasional overnighter, we've had the place to ourselves. I'll echo the previous review that we've felt completely safe here. It's a very quiet and peaceful location. It gets fairly windy every day, starting from the east and swinging around west. The lake is nothing but some meandering streams and there are cows grazing in the lakebed, but it offers a unique beauty. It's super dark at night and the Milky Way is already visible in twilight. Groceries are available about 15 minutes to the south and 20 minutes to the north. Sites have 30/50 and water but only the host site has sewer. Dump station is functional and convenient. Sites 7, 8 and 9 are doubles that cost twice as much, which is not readily apparent until you open the envelope box to pay. I would say 12 (pull-thru) has one of the best views. We camped at Yuba State Park - Painted Rocks Campground in a Travel Trailer. Although the lake is very low this time of year, the sunsets over the surrounding mountains are spectacular. Our site had a great view, was reasonably level and easy to access. There were a handful of people camped in another area of the park, and when we left it appeared someone was doing their laundry at the dump station, but overall it felt safe despite no attendant or camp host. We camped at Yuba State Park - Painted Rocks Campground in a Motorhome. 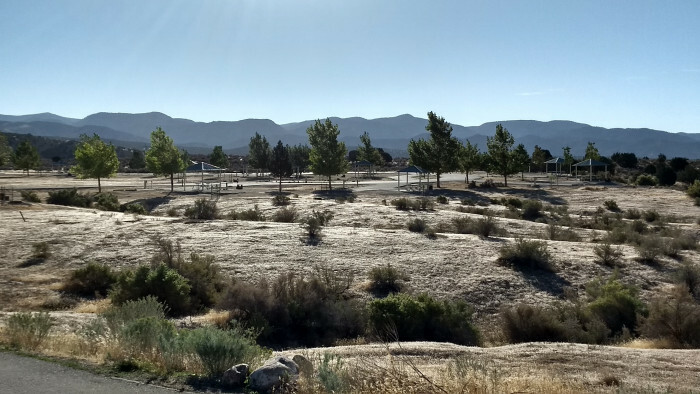 This park is one of the best laid out parks we have ever encountered. Almost every site will accommodate a big rig and they are very easy to access. One thing to note is that the Utah Parks website and the sign at the highway entrance both proclaim full hook up sites available. They seem to regard electric and water as full hook up as only the camp host site has sewer. This is not a problem if you are only staying a night or two or arrive off season and are the only rig in the camp as we were and are willing to pay the extra $10 for the host site, which we weren't. The lake was empty and we were the only ones in the campground. 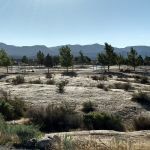 We camped at Yuba State Park - Painted Rocks Campground in a Fifth Wheel. We arrived on a Friday afternoon and found that all but 2 sites were reserved or occupied and settled on the back in that was somewhat sheltered from the wind, connected the electric and water, paid the iron ranger and then remained inside due to the heat and strong winds. A lot of ATV activity, but not particulally annoying. The following morning quite a number of reserved sites remained empty - hmm, and we had seen people being turned away. We camped at Yuba State Park - Painted Rocks Campground in a Motorhome. Very happy to find this place. It was cold and rainy, but I was just looking for a place for a night on my way from Provo to Zion National Park, and this was perfect for what I wanted. Sites and roads are paved and in good condition. Most sites have water and electric, and if you get here off-season, you can use the host sites with full hookups. I also picked Site 12 because it was a very long pull-through with a terrific view of the lake, which is low on water, but still very scenic because of the mountains in the distance covered with snow. Sites are spread out nicely, with covered picnic tables, but no shade otherwise. Only three other campers here on weekday, so lots of privacy. Be warned that there are no showers here and restrooms look pretty basic--maybe pit toilets? I did not go in. I will definitely use this place for a quiet, peaceful, scenic place to hang out in the future. I got 2-3 bars of Verizon LTE service, which made me happy. We camped at Yuba State Park - Painted Rocks Campground in a Motorhome. Not much around here, but very pretty mountains and lake. As earlier poster mentioned, make sure you drive through Levan or Fayette and take the entrance off UT-28 or you will be on the wrong side of the lake! Also, this could be a good stopping place on the way to or from Capitol Reef National Park. I was very relieved to find this campground open. The lake is almost non-existent now and I worried the facility would be closed. Thankfully it was not! There were only three or four campers, so plenty of room. We had a nice spot (#12) overlooking what was left of the lake. Our nearest neighbor was many spaces away, but was one of those dog owners who open the door to let the dog out rather than putting it on a leash and accompanying it (and picking up after it). Other than that, the stay was nice enough. Very quiet with no highway noise at all. When we left, there were quite a few cows on the road, apparently escapees from the range nearby. We camped at Yuba State Park - Painted Rocks Campground in a Motorhome. During the winter this lake is used for ice fishing and other ice-related activities. During the spring when the lake has more water, hiking to the lake is nice, but if it's muddy be aware that this type of mud is like construction adhesive and you will not be able to get it off your shoes. You will also be about 2" taller because it builds up. Arrived to a pay station and sign saying to fill out fee envelope before entering, but we couldn't fill out until we found a site. We drove through both sides of the park and found a back in site on top of the hill overlooking the lake. There are no showers in our area. The sites are spacious, somewhat level, with a large concrete pad. Sites have W/E only with a nice dump station. We arrived during the week and it was mostly empty. It apparently is full on the weekend, so suggest reservations. Hiking trail down to the lake and around to the boat launch is very nice. Was extremely windy the days we were here. We would return. We camped at Yuba State Park - Painted Rocks Campground in a Fifth Wheel. The directions on ReserveAmerica take you to Oasis with a sign pointing down a dirt road to Painted Rocks. Do not take that road because it is about 20 miles long! Go back to the freeway and go to Levan and then go south on 28. We visited after Labor Day so there was no one at either gate to explain this to us. But I am so glad that we found Painted Rocks because it was awesome. All of the sites are very nice with water and 50 amp power. There is a nice dump station and convenient vault toilets. We stayed in site 12 and had a view of the lake. 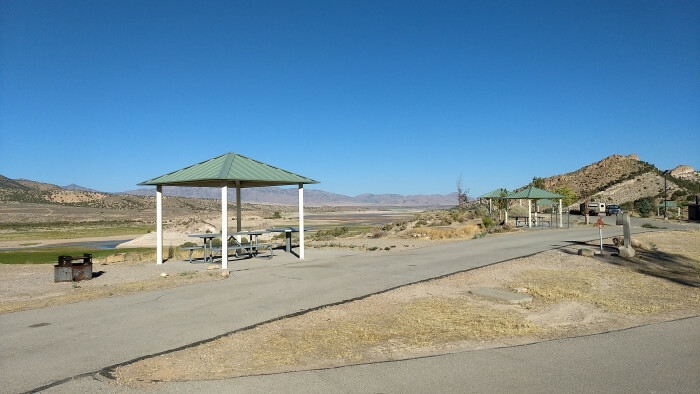 Most sites are level and large with a covered picnic table on a cement pad. The interior roads are wide and easy with a big rig. There are no showers, no trees, no laundry and no playground. But there is plenty of walking, hiking and fishing. The views are magnificent. Since it was late in the season we were the only ones there but I can imagine that in the summer on weekends especially it is very noisy when full. We camped at Yuba State Park - Painted Rocks Campground in a Motorhome. 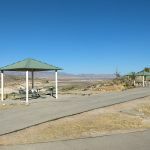 There are two campgrounds suitable to tents, trailers, and motor homes at Yuba State Park in Utah. 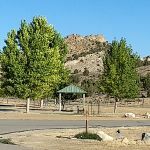 It is important not to confuse the Painted Rocks Campground which is on the east side of the lake with the Oasis campground on the west side, as access to the two campgrounds can be confusing for the first time visitor. 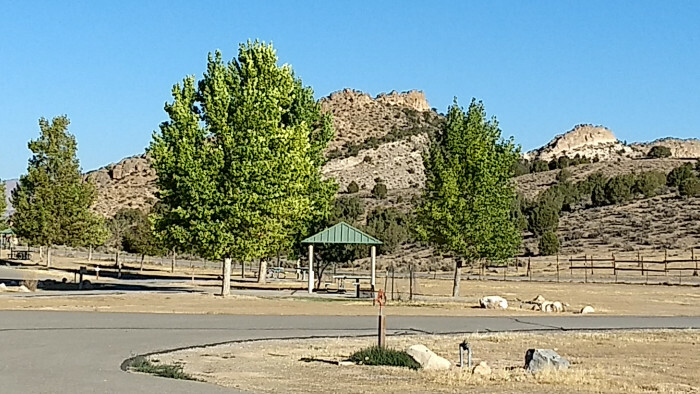 The Oasis campground is easily accessed via I-5 however to get to Painted Rocks campground from the West entrance you will need to travel 12 miles on a gravel road. I highly suggest using the paved road access to Painted Rocks campground on the East side of the lake but you will have to leave I-5 some distance from the West Entrance to get there. Additional information is readily available through the Utah State Park web site. The sites are well spaced with many providing a nice view of the lake. This park has few trees and virtually no shade. However each site has a covered picnic table providing shelter. Boaters can launch just 1/2 mile down a paved road to the lake. Reservation can be made via the Utah State Park web site or Reserve America which is tied into the State system. The restrooms do not provide "Flush" toilets but are very clean. Of the 77 sites available, 29 are listed as "Partial Hookup" which means 50 amp service if you need it and water. The campground host did mention that if washing cars to wipe immediately as the local water does have a tendency to leave "water marks". We enjoyed our stay. The park is like many other State facilities in that it is normally very busy on weekends but much quieter during the week. There were only 4 other campsites occupied during our first week night visit there. We camped at Yuba State Park - Painted Rocks Campground in a Motorhome. Are you affiliated with Yuba State Park - Painted Rocks Campground ?